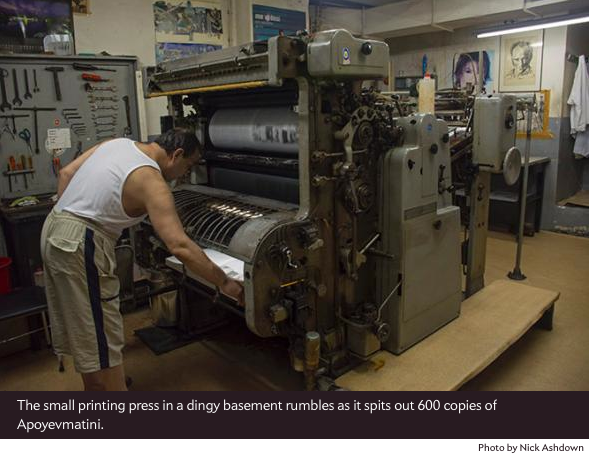 ISTANBUL—In the grotty basement offices of a small publishing house in central Istanbul, five shaggy men stack and fold a four-page daily newspaper while a sixth man, wearing an undershirt and shorts, runs a small noisy printing press. The men, all Turkish, cannot read a word of the paper because it’s in Greek. Soon they will hand-deliver all 600 copies of Apoyevmatini (which translates to “afternoon”), almost one for every remaining Greek family in Turkey. Three of the men have been delivering the paper for 30, 50, and 60 years, respectively. Sebahattin Esen, 56 and unshaven with a warm smile, says he feels like he’s a part of the Greek community. “I regularly come inside, have a coffee with them and chat,” he says. Turkey’s once-significant Greek population now sits on the verge of extinction thanks to repressive state policies that forced or compelled them to leave the country during the 20th century. Lacking a large readership to support it,Apoyevmatini is also in danger of folding. It’s 11:00 a.m. and time to deliver. I tag along with Mustafa Yorukcayir as he walks his winding route through Cihangir, a historically Greek neighborhood that is now the dominion of expats, artists, and intellectuals. We walk past the enormous marble pillars of the 120-year-old Zografeion Lyceum for boys, one of the last Greek schools in Turkey. Yorukcayir hands papers to a couple of stern-looking, grey-haired men, among the last representatives of a vanishing people. Nowadays they mostly read the paper to check the obituaries, Yorukcayir tells me.